Composite or multicomponent materials are widespread in the aviation and automotive industry since they compete with metals in their characteristics but weigh much less. Due to this multicomponent composition, it is difficult to test the quality of such materials. Materials can contain very small hidden defects, i.e. delamination, cracks, impact damage. Their size is literally a few millimeters. The exploitation of such products, for example, in aviation, can lead to a disaster. Photo: In the lab of the Institute of Strength Physics and Materials Science SB RAS. Credit: Vladimir Beloborodov. 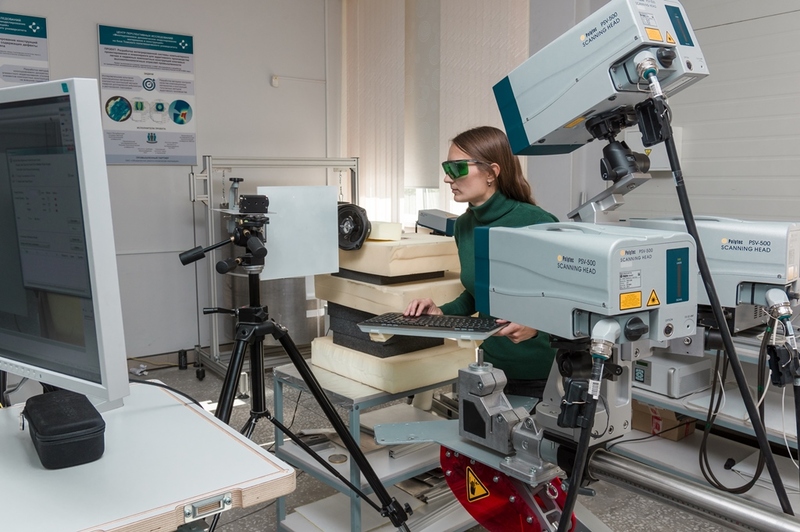 Daria Derusova, JRF from the TPU Research School of High Energy Physics is developing a system combining three methods of non-destructive testing including a vibrational, resonant ultrasonic and thermal ones. 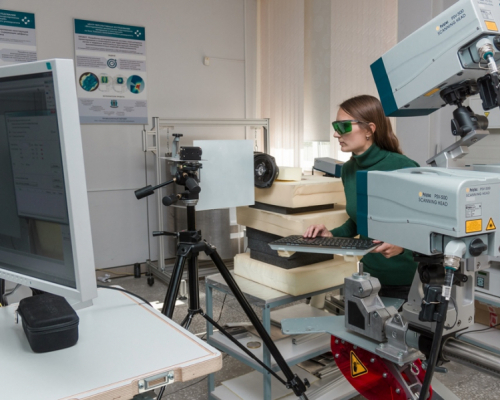 This approach is of interest for aviation and automobile industries as it will make it possible to monitor the quality of complex and large-sized products made of composite materials taking into account their physical properties. The Russian Science Foundation has supported this two-year project up to 2020. Now classic ultrasonic and X-ray testing are used at the production. ‘The latter is the most accurate but it does not fit to large-sized objects that are presented in aviation a lot. In turn, ultrasonic facilities consume kilowatts of electricity to stimulate materials with a mono-frequency acoustic signal. Laser vibrometry in the combination with resonant stimulation of defects is seen as the most promising modern method. Such an approach allows activating local resonant vibration in the area of damage that also causes the increase of temperature in this area. In turn, an infrared camera will allow the registration of the temperature change and the addition of data about the quality of products. The facility will comprise of such elements as resonant ultrasonic stimulation using piezoelectric transducers, a scanning laser Doppler vibrometer and an infrared camera with specialized software. ‘The essence of the system is that a tested object – material is exposed to acoustic stimulation in a wide range of frequencies. Elastic waves create vibrations of both material itself and its inhomogeneities. The resonant frequency of vibrations of defects’ walls differs from that of the object that can be detected with a scanning vibrometer. In addition, due to intense resonant vibrations defect areas are locally heated. We register these changes with an infrared camera. The data of quality testing allow us to identify a defect itself, its location, form, and size,’ clarifies Daria Derusova. In the framework of this project, TPU scientists cooperate with peers from the Institute of Strength Physics and Materials Science SB RAS (Laboratory for Quality Testing of Materials and Structures), the University of L'Aquila (Italy) and the Symbiosis Institute of Technology (India). The S.А. Chaplygin Siberian Research Institute of Aviation (SibNIA, Novosibirsk) provides samples of materials for testing proposed technology.